Inspired by the wedded bliss of Heartwood's friends, Louise and Jimmy Boyd, we present the true birding bliss of Boyds’ Bungalow. Pretty as a picture, with delightful dormer window and shingled roof, Boyds’ Bungalow is also the perfect marriage of form and functionality, built to last thanks to hardy cypress construction with verdigris copper ridge piece and roof cap. The honeymoon between you and your birds will never end when you say “I do” to this adorable abode. 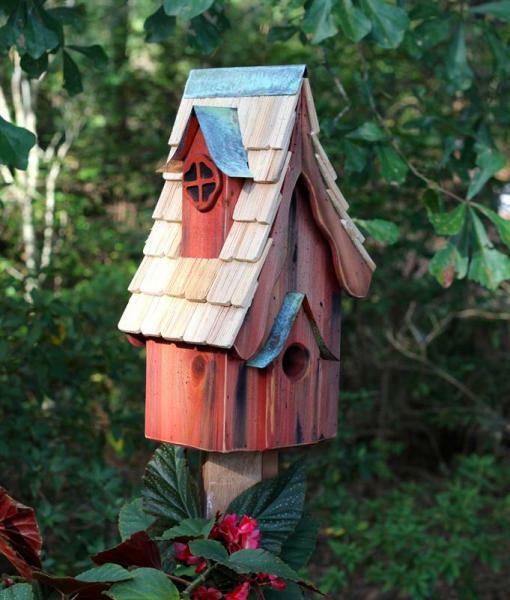 This is a good size and quality birdhouse that is solidly built. Comes with metal mounting plate.